I had a wonderful weekend in Southern Idaho, celebrating the 40th anniversary of the class with whom I started first grade. 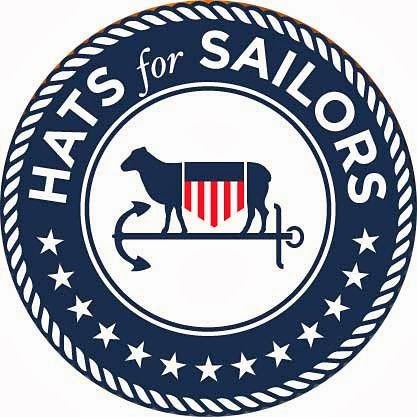 Now it's back to our regularly scheduled blog post! The little boy one has some of my FILs shirting in it. It goes to my niece who was very close to her grandfather. 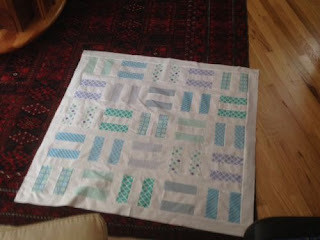 The other goes to a friend's first granddaughter due in July. I like that Jen has decided a finished top is a finished quilt -- remember, I told you that YOU determine what is finished! 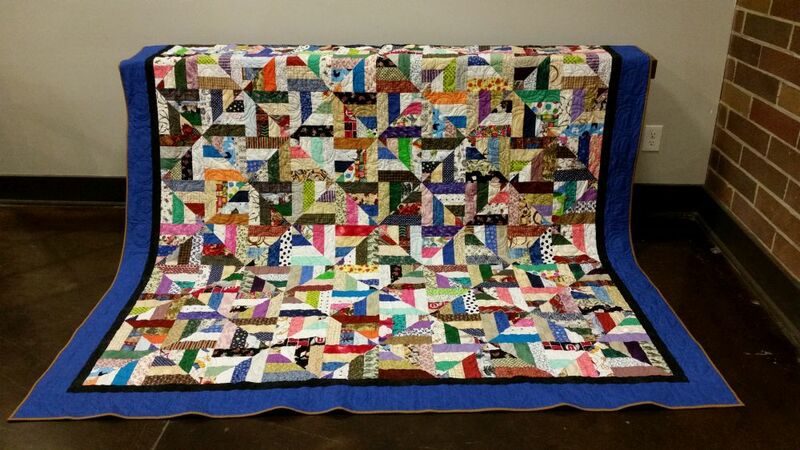 For me, a pieced top is finished, because most of my quilts go to a professional long-armer. Jen is a schoolteacher, so the end of the year is busy busy! But she completely finished this quilt using the "Joy" pattern from Villa Rosa Designs for a teacher friend whose baby was a preemie. 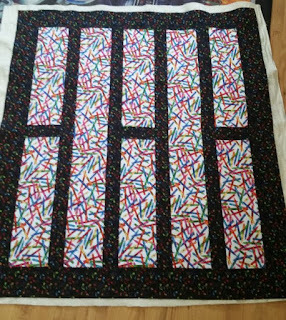 Below is another "kids" quilt. It features one of my favorite fabric lines from Zen Chic for Moda, "Sphere." 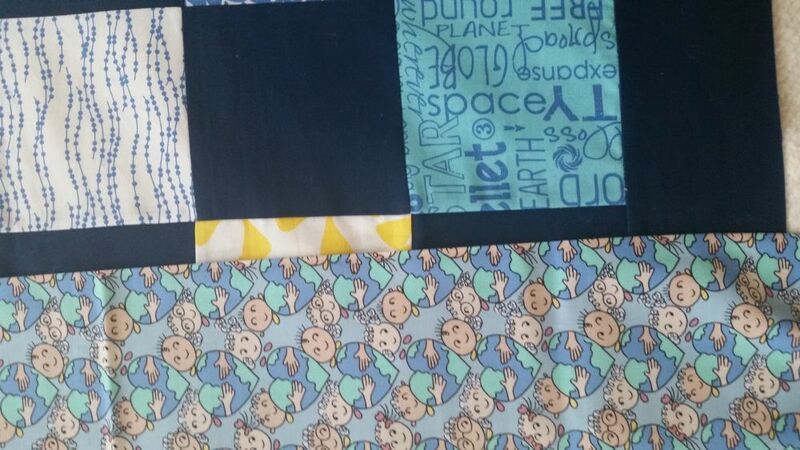 Jen writes that she isn't sure what backing to use -- but Jen, I love the "kids" fabric for a baby quilt! 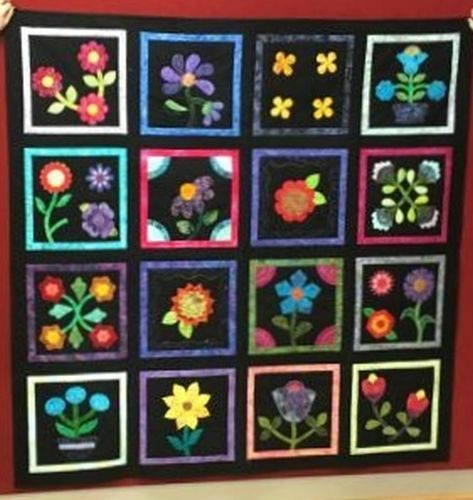 was started in 2011 – a series of c lasses at my LQS – the quilt is called Stitchers Garden. 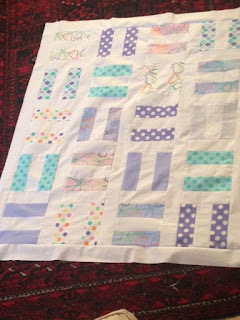 I leant a variety of techniques, such as bobbin work, applying cording to make an outline, using the circular sewing attachment - and I used almost all the decorative stitches on my machine. 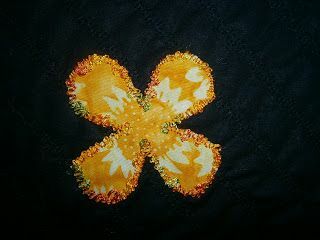 It was a fun way to learn….and I certainly increased my collection of balis and embroidery threads along the way. 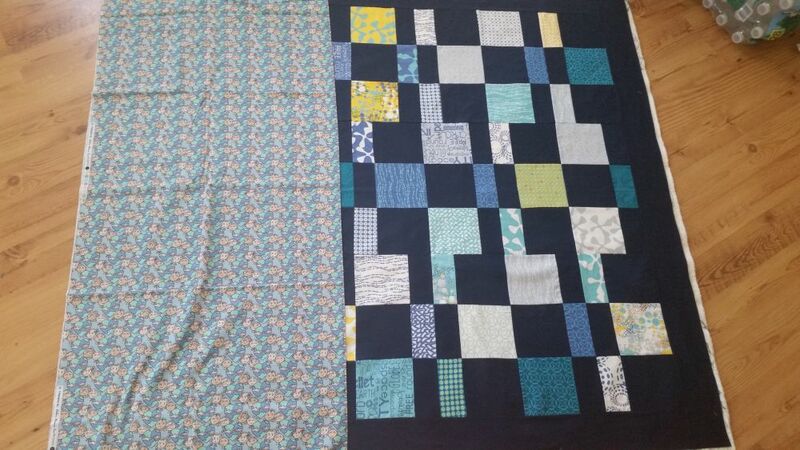 Here are two more finished from Jennifer, who cleaned up and organized her sewing room, and is really going to town on the finishes! 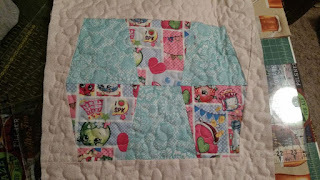 She tells me the first one is a "Shopkins" placemat for her daughter, who is Shopkins obsessed. Shopkins is a toy manufactured by Moose Toys. Based on grocery store items, each plastic figurine has a face and unique name. The collectible toys (which are designated as common, rare, and ultra rare) have also spawned a line of books and trading cards, as well as a YouTube channel. 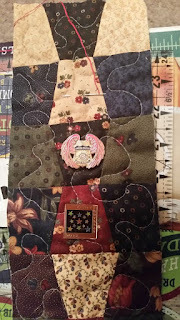 Her last finish is a wall hanging for quilt pins. It's about 4 inches wide and 26 inches long. Isn't that a clever idea? 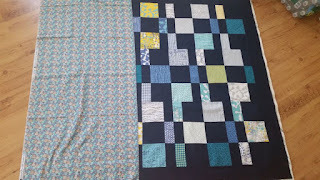 Due to miscuts of fabric by the students, some of my pieces were given away so they could finish theirs. I was pleasantly surprised to find the two fabrics I needed in January when I visited a shop I had never been to. 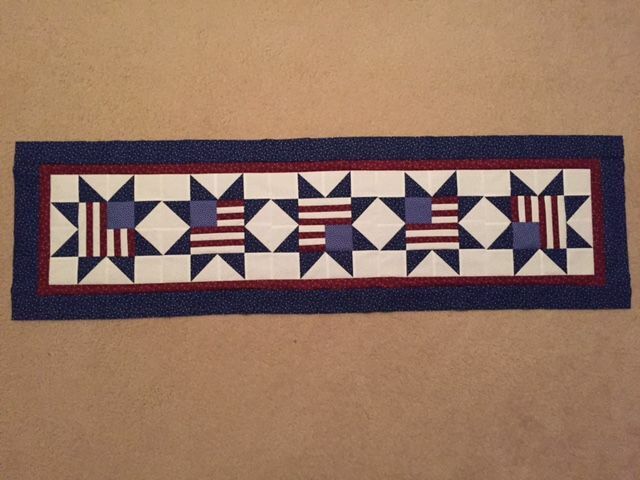 My tablerunner is now complete, just in time for 4th of July! Joy, I bet it's on your table today! It just wouldn't be a UFO Parade without a Bonnie Hunter quilt, and Becky caps our parade with this terrific scrappy quilt. 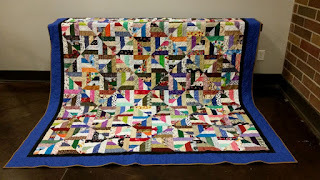 I finally finished the binding on my UFO just an hour ago! Then the hard part was finding someplace big enough I could spread it out for a picture (it is full size)! The pattern is Strip Twist from Bonnie Hunter's blog: http://quiltville.blogspot.com/2005/06/strip-twist.html. The first time I saw it I thought, "Wow! 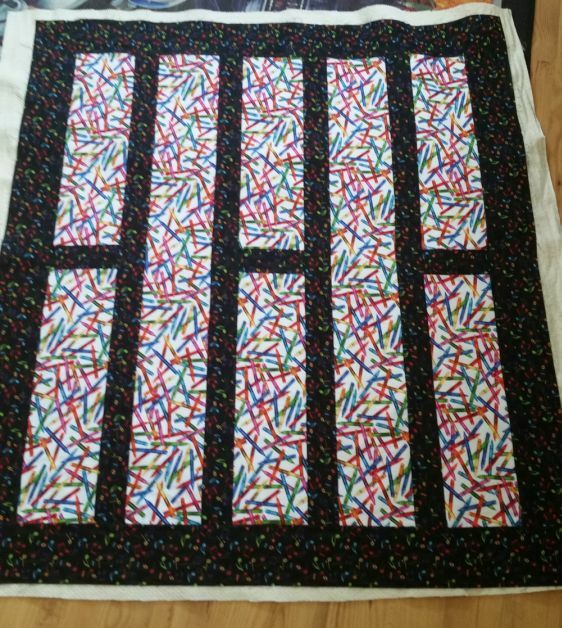 That is a busy quilt! I don't think I could ever make that pattern, too busy." But the more I saw it the more it grew on me, especially when I actually read the pattern and saw how easy it was. 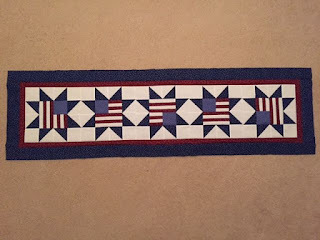 One day I was trimming down some scraps and this pattern was on my mind so I thought, "I'll just make a test block to see how hard it really easy." Like potato chips, one just wasn't enough! 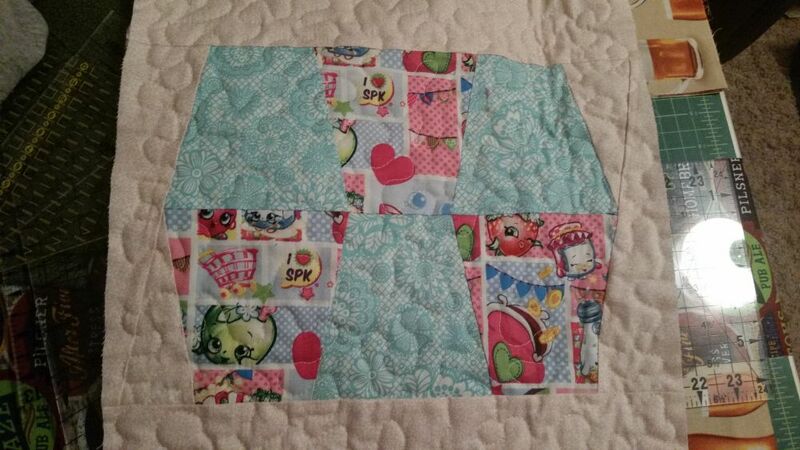 The top came together quickly enough, it's the quilting and binding that had it sitting in the UFO pile for awhile! 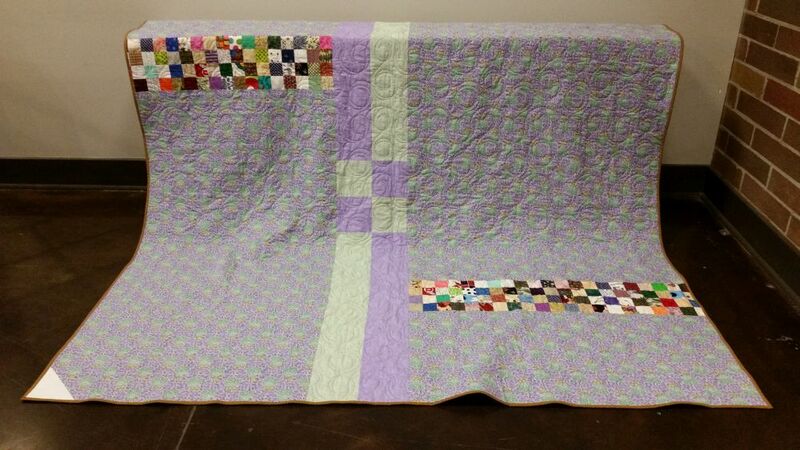 My backing fabric wasn't quite big enough, but fortunately there were enough leftovers from the top to stretch it, with a little help from some green and lavender from my stash. 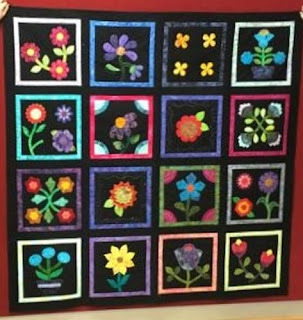 Beck, I'll be heading to Quiltville.com to find this pattern! 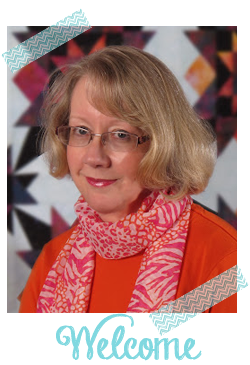 Here's hoping all my American friends are enjoying Independence Day -- and that it's a work holiday so you can quilt! Great work ladies - thanks for the "Shopkins: info - never heard of it here. Happy Independence day to everyone...seems strange to us not to have a national holiday, now I know how your holidays work (very flexible!!) I realise Australia really is a very lucky country. A reunion with grade one - that would be an eye opener for sure - normally we would do it for the lat year of secondary education. Another month come and gone. I just can't seem to motivate myself this year to finish anything. 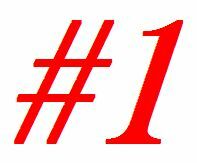 I mentioned your numbered UFO challenge in our last guild newsletter. I even thought about finding out the last six numbers for the rest of the year and joining in, but I need more clear air before I can commit. It is still a marvellous idea. Maybe next year.